Nashville's a city chock-full of Hot Chicken joints and Mexican restaurants, so when ramen noodles popped up on the scene, we were a bit skeptical. I mean, weren't these the same bowls of sustenance we survived on in college for $0.25 a packet? However, it turns out that skepticism was for naught, as we began flocking into ramen spots faster than we could slurp up the rich noodle-filled broth. Ramen, you've earned a special spot in Nashville. And Nashville, here are all the special spots to find the best ramen. 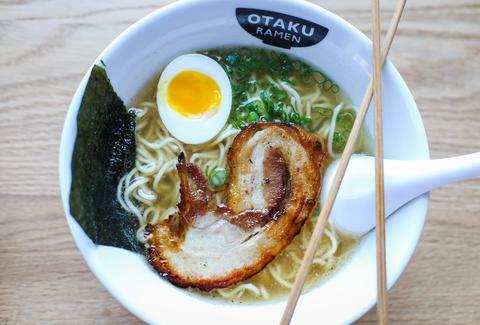 Otaku started out as a pop-up in East Nashville, however, its popularity took off quicker than it takes its pork broth to simmer. In December of last year it opened up a permanent location in The Gulch, and since then has had frequent lines stretching out the door. The menu includes four different delicious ramen options including pork, chicken, and vegetarian. And don't miss out on the hot chicken buns. Two Ten Jack is easily a contender for the number-one ramen in Nashville (not that we're biased or anything). This Japanese-inspired pub puts great care into creating its ramen dishes, each of which is packed with flavor. The atmosphere at Two Ten Jack provides the perfect dark and romantic spot to slurp your noodles while enjoying a good cup of sake and a small plate of crispy Brussels. While all of the ramen dishes are phenomenal, we’re partial to the tonkotsu ramen with a bit of burnt garlic oil added on. 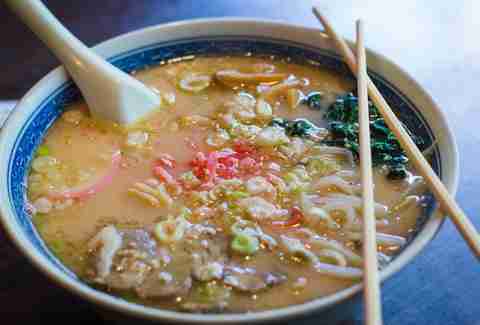 Ichiban serves a classic pork broth ramen dish, which has been a classic in Nashville for many years. 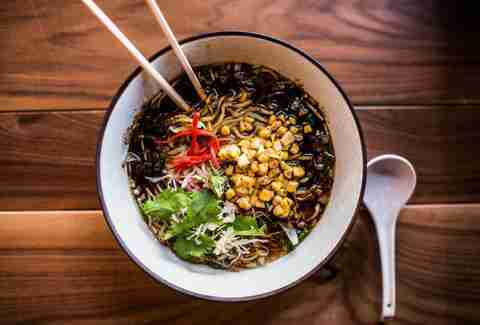 The dish is sometimes easily overlooked because of the extensive menu of traditional Japanese dishes, however, the ramen is most certainly one to sample. The tonkotsu broth is simmered with great care and is loaded with intense flavor. Finding parking near 2nd Ave can be a challenge (unless you're willing to pay an arm and maybe a leg) but a trip to Ichiban is worth it. There's only one ramen dish on the menu, but it's good. Really good. 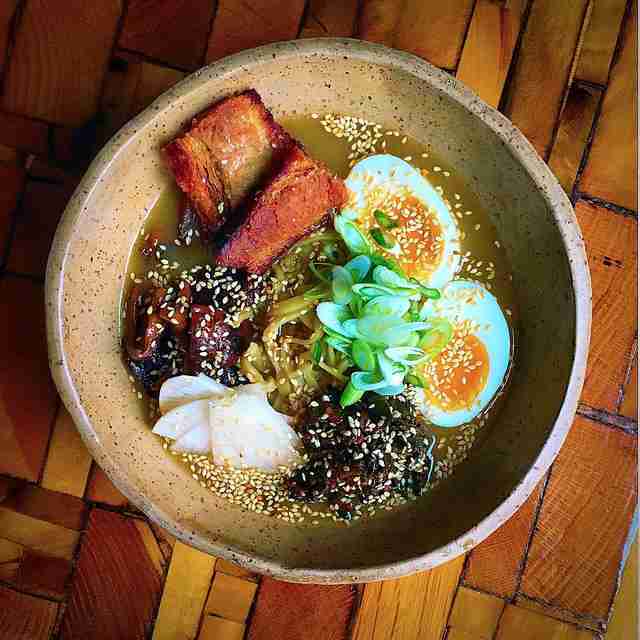 Virago's ramen is on the menu as "Southern Ramen." 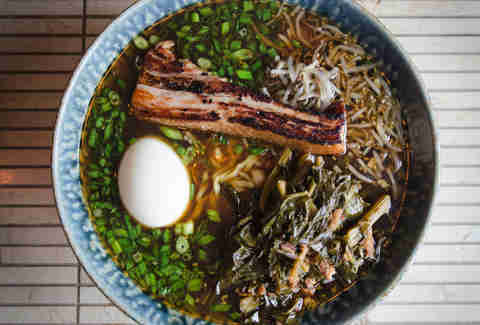 It's a delightful mix of classic ramen (triple stock, a soft-boiled egg, and pork belly) and a little bit of what makes our home in the South so special (collard greens and Tabasco bean sprouts). If you're looking for a uniquely Southern take on this Japanese noodle dish, we highly recommend Virago. Tonkotsu ramen was a delightful addition to The Treehouse's late-night menu. This pork belly ramen is served with house-made noodles, soy-pickled mushrooms, kale kimchi, shaved turnips, and (of course) a perfectly soft-boiled egg. The Treehouse boasts an eclectic menu with an atmosphere to match it and has a skillfully crafted list of house cocktails to choose from. Ru San’s has three different ramen options that are on the menu as "Big Bowl Soup-Ramen." There's a vegetarian option as well as a scallops-and-shrimp option and a more classic pork option. This casual Japanese spot serves a buffet during the day for lunch, and its full menu at night, but luckily its big bowls of ramen are available anytime. Brita Britnell is Nashville-based food photographer and writer who has slurped her fair share of Nashville's finest ramen. Find her: @bbritnell.